2019 Field Day results will appear in December QST. Want to see what 2019 Field Day is all about? Watch our (2019) Updates Pending Field Day Public Service Announcement or view what several groups uploaded to Youtube from their 2018 Field Day activities. Looking for a Field Day site near you? Want to promote your club's Field Day efforts? Use the Field Day Locator to do both! We welcome the public to come learn more about ham radio! Use our Field Day Locator to search for a Field Day site near you. Field Day on Social Media! 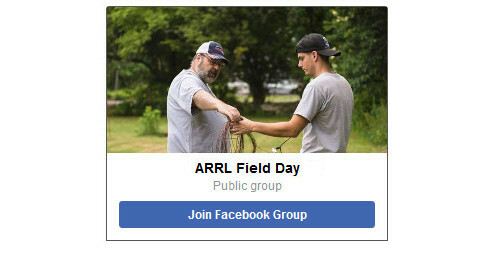 Click below to join the ARRL Field Day 2019 Facebook Group. Share your plans, tips and tricks to a successful Field Day. When posting content from Field Day, use hashtag #ARRLFD on all social media to receive 100 bonus points! To work as many stations as possible on the 160, 80, 40, 20,15 and 10 Meter HF bands, as well as all bands 50 MHz and above, and to learn to operate in abnormal situations in less than optimal conditions. Field Day is open to all amateurs in the areas covered by the ARRL/RAC Field Organizations and countries within IARU Region 2. DX stations residing in other regions may be contacted for credit, but are not eligible to submit entries. Field Day 2019 is June 22-23. Entries must be postmarked, emailed or submitted by Tuesday, July 23, 2019. - Entry contents used to determine final score and awards will be available to the public. For Field Day information contact ARRL: fdinfo@arrl.org or (860) 594-0232. Find a Field Day site near you or input your site to share with others. Note: If you are entering a new Field Day site, you must be logged into the ARRL website for your Field Day entry to be automatically posted on the Field Day Locator. If you are not logged in, your site will not be listed on the Field Day locator until it is reviewed by ARRL staff. ARRL members and affiliated clubs may use the ARRL Field Day logo on the following personal or club promotions of their participation in the event: websites, news postings, calendar listings, flyers, posters, signs, banners and social media sites. The logo CANNOT be used on any items intended for sale (shirts, mugs, calendars, etc. ), or as part of advertising or other commercial promotion including websites, auction listings, etc. The logo MAY NOT be altered in any way, and may not be incorporated into any other design or logo. If you are interested in using the logo outside of these requirements, contact permission@arrl.org. Copyright 2019, American Radio Relay League, Incorporated. All rights reserved. View the Contest Results Articles for results from previous Field Days. Official ARRL Field Day shirts, hats, mugs, participation pins and patches are a great way to recognize your involvement in this popular, annual operating event! Advance orders for 2019 Field Day merchandise will begin early March. Products begin shipping in April. For Field Day Supplies Go Here (while supplies last). It is unlawful to reproduce or copy ARRL logos and illustrations. Copyright 2019, American Radio Relay League, Incorporated. All rights reserved. National: 30-second audio PSA. no room for local contact info. Directs listeners to ARRL Field Day web page. Local: 30-second audio PSA with :08 second tag at end for local contact information. Generic: 30-second video PSA (MP4) with no area for local contact info. Directs viewers to ARRL Field Day web page. Local: 30-second video PSA (MP4) with :08 second tag at end for local contact information. Tell us about your Field Day experience! Get helpful hits and tips about contesting: Maps, forms, grid squares and more!